Here is a version of my gluten free chicken nuggets. They can be frozen and kept in a freezer bag for a few weeks, just defrost overnight in the refrigerator before use! Place the chicken pieces into a bowl, and sprinkle with flour salt and pepper. toss to coat the chicken pieces. In a separate bowl, add the eggs and beat them out. In a third bowl, mix the polenta and paprika together. Dip the chicken into the beaten egg, and transfer to the polenta. Coat the chicken pieces and place them on the baking tray, lined with baking parchment. Cover with cling film and store in the refrigerator until needed. Preheat the oven to 200°C/400°F and a deep fat fryer to 180°C with clean oil to avoid gluten cross contamination. Chop the potato about 2 -3 millimetres square thick and about 6 cm long. Keep in a bowl of water until needed. Blanch the peas in boiling water for 2 minutes (3-4 minutes if frozen), strain the peas and place back into the saucepan. Add the butter and keep aside for a few minutes until the nuggets and fries are ready. In the meantime, remove the chicken nuggets from the fridge and drizzle with the sunflower oil. Bake in the oven for 10 minutes, then turn the chicken pieces and bake for a further 5 – 6 minutes. Deep fry the skinny fries in the preheated oil for 4 -5 minutes until crispy and golden. Remove from the oil, and drain into kitchen paper to remove the excess oil. 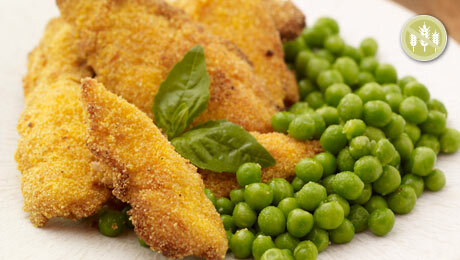 Serve immediately with chicken nuggets and buttered peas!